Dubai, UAE, October 11, 2018: With the Manero Peripheral, Carl F. Bucherer has created a timeless classic of understated elegance. The COSC-certified chronometer is now joined by new versions, whose rose gold and stainless steel cases have grown to a diameter of 43 millimeters, in line with current trends. The Lucerne-based watch manufacturer has thus given the CFB A2050 caliber a more spacious frame. The caliber, developed entirely in-house, is equipped with a peripheral automatic winding system, just like all of the manufacture calibers of the successful family business from Lucerne. As the first watch manufacturer to do so, Carl F. Bucherer has put this winding system into series production, cementing its position as the pioneer of this innovative technology. The peripheral rotor that powers the watch revolves around the movement. This provides an unhindered view of the wonderful and high-quality movement, which is not concealed by a conventional winding rotor. Baselworld 2018. The Manero Peripheral combines state-of-the-art technology, traditional watchmaking, and a classic shape. In 2016, the innovative CFB A2050 manufacture movement celebrated its debut in the very successful Manero family, which Carl F. Bucherer is now expanding systematically. For those who prefer a larger size and showcasing individuality, the watch manufacturer from the heart of Switzerland is now offering six new versions of the Manero Peripheral with a 43-millimeter case. Customers can now choose between two rose gold watches with an alligator-leather strap and four stainless steel watches that are equipped with either a leather strap or steel bracelet. The new timepieces launched at Baselworld 2018 supplement the collection's existing 40.6-millimeter models. The classic, round case may have grown in diameter, but did not lose its timeless form. Sharp edges and soft curves combined with polished and matte surfaces are the hallmarks of the timepiece's elegant appearance. Even with its larger size, the watch has retained its exquisite proportions, something that is also true of the piece's painstakingly crafted dial. The appliqu�d wedge-shaped indices have grown proportionately to the case, as has the minute hand that so accurately rotates around the chapter ring. The coloring of the lancet-shaped hands and indices corresponds perfectly with the case material. In 2016, the Manero Peripheral provided the perfect setting for a completely new development from the recently expanded factory of Carl F. Bucherer – the CFB A2050 caliber, which combines modern technology and classic watchmaking in a unique manner. In addition to a central hour and minute display, all Manero Peripheral models – including these new versions – feature a small-seconds subdial at 6 o'clock and a date display at 3 o'clock. The automatic movement, which is certified as a chronometer, draws its power from a bidirectional automatic winding system with a peripheral rotor, which thus provides an unhindered view of the movement – a specialty of Carl F. Bucherer. As the world's first watch manufacturer to do so, the company put this principle into series production in 2008. The movement, decorated with Geneva stripes, underscores the elegant appearance of the new Manero Peripheral, while a power reserve of 55 hours underlines its lasting reliability. To mark the launch of the 43-millimeter Manero Peripheral, Carl F. Bucherer is offering both classic and unusual color options. For example, the rose gold model with a white dial is now also available with a light brown alligator-leather strap. The second rose gold watch features a black dial and a matching leather strap. The stainless steel versions are also available with a white or black dial in combination with a light gray or dark brown alligator-leather strap. 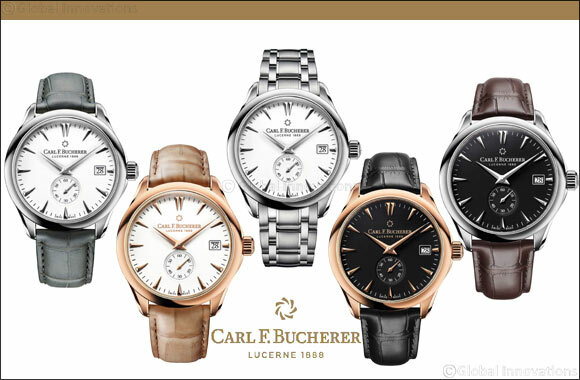 Alternatively, Carl F. Bucherer also offers stainless steel bracelets with a folding clasp for the stainless steel models. Whatever the choice, customers are sure to invest in timeless quality with a Manero Peripheral.